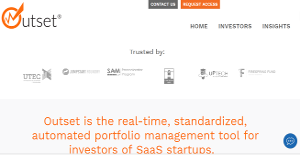 Outset is built for investors of SaaS startups, and functions as a standardized automated portfolio management platform that delivers real-time metrics to its users. The software comes with investor-centric dashboards as well as more than 12,000 integrations with US banking establishments, payment gateways, and accounting software that update in real-time both at the portfolio and company level. With Outset, you work with reliable and updated data whenever you need them. This gives you all the information you need to make all the right decisions about your SaaS startup investments. The software is user-friendly and automates all your processes. All you have to do invite your founders to your fund and let Outset take care of the rest. Outset delivers you critical data on your SaaS startup investments whenever you need it. The system provides you updated information in real-time so that you are able to make the best decisions and take the most viable actions regarding your investments. Outset eliminates the need for you to wait for founders to gather their data and compile them into reports. You don’t have to waste days and months digging through old materials. You need information and Outset gives it to you fresh. Updates should be delivered to you automatically. With Outset, you have a dashboard that automatically notifies you of changes and updates pertaining to your accounts. The process is so simple – just invite your founders to your fund and you are done. You don’t have to perform any setup or manual entry. Everything is automatic. Outset is built from the ground up by SaaS investors who are well aware of the metrics that matter to you. The system automatically calculates all the SaaS metrics essential to your portfolio and individual companies so you won’t have to. Among the metrics Outset calculates include Burn Rate, Cash on Hand, Days to Live, MRR, Churn, LTV, CAC, and more. From there, you can communicate portfolio performance to LPs, gauge and compare order investments against particular indicators, or ensure that founders won’t go dark. What Problems Will Outset Solve? 1) Investors have no idea how much cash their investments have left. Outset shows them nightly by connecting directly to their investments bank accounts. 2) Investors can only report portfolio performance to investors quarterly, 45 days after the quarter closes. By connecting to each investments bank, payment gateway, and accounting platform, Outset rolls all company specific data up into a portfolio-level view to show investors how their entire portfolio is doing on all metrics. 3) Investors have no idea where their companies are struggling unless a company tells them specifically. By having all the data connected, Outset can show investors exactly where companies are failing at exactly the right time. Every business is different, and might need a special Project Management Software solution that will be designed for their business size, type of clients and staff and even specific niche they deal with. You should not count on getting an ideal app that is going to work for each company regardless of their history is. It may be a good idea to read a few Outset reviews first and even then you should remember what the solution is intended to do for your business and your staff. Do you require a simple and straightforward service with just elementary functions? Will you actually use the complex functionalities required by experts and big enterprises? Are there any particular tools that are especially practical for the industry you operate in? If you ask yourself these questions it is going to be much easier to find a solid solution that will fit your budget. How Much Does Outset Cost? We realize that when you make a decision to buy Project Portfolio Management Software - PPM it’s important not only to see how experts evaluate it in their reviews, but also to find out if the real people and companies that buy it are actually satisfied with the product. That’s why we’ve created our behavior-based Customer Satisfaction Algorithm™ that gathers customer reviews, comments and Outset reviews across a wide range of social media sites. The data is then presented in an easy to digest form showing how many people had positive and negative experience with Outset. With that information at hand you should be equipped to make an informed buying decision that you won’t regret. What are Outset pricing details? What integrations are available for Outset? If you need more information about Outset or you simply have a question let us know what you need and we’ll forward your request directly to the vendor.